(Indian Ocean Observatory) - At his offices in the second floor of Kibaki Flats in Bamburi Beach on Kenya’s coastal region of Mombasa, Dr David Obura has a commanding view of the Indian Ocean. Sounds of waves lapping on the beach, Indian crows on the nearby trees are a constant companion. The sea breeze gushes into his office providing relief from the searing heat of the Kenyan coastal region. His offices are not different from a library. Shelves stacked with marine science books and journals stacked adorn this office. The events of 1998 are still etched in Obura’s mind as if they happened yesterday. 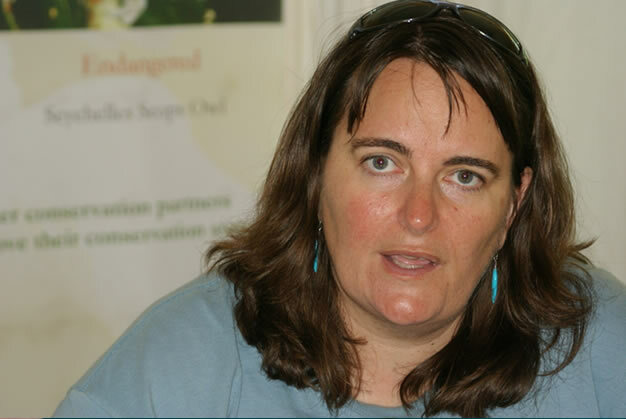 At the time Obura was working as a marine researcher at the Kiunga National Marine Park, which is in Kenya’s northern most coastal tip bordering Somalia. Slightly more than 2000 kilometres away at Amitie, a breezy and slow-moving locale of Praslin island, which is the Seychelles' second largest island after Mahe, the effects of coral bleaching were also experienced here. Amitie is where the not-for-profit organisation Nature Seychelles coordinates a unique and elaborate coral reef restoration initiative. 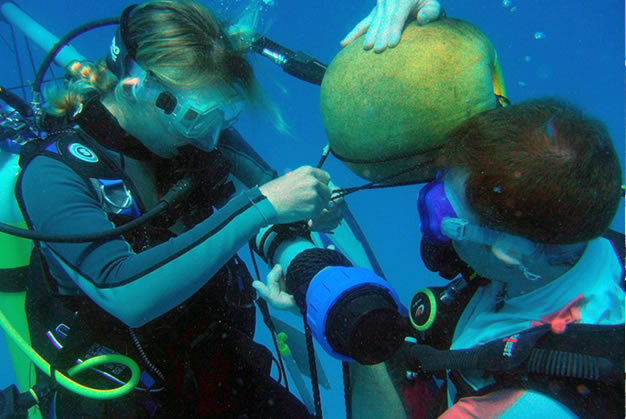 Nature Seychelles marine scientists Claude Reveret and Dr. Sarah Frias-Torres spearhead this labour intensive coral replanting exercise. “This is our response to climate change effects,” Reveret says. Every working day Reveret and Frias-Torres accompanied by a team of scuba divers descend into the ocean floors around Praslin and the nearby Cousin Island Special Reserve for this unique undersea gardening project. Seychelles is an archipelago of 115 islands in the middle of Indian Ocean known worldwide as a tourist destination of choice thanks largely to its scenic beaches. As a Small Island Developing State (SIDS) faced with diverse natural vulnerabilities, Seychelles conservationists are adapting fast to climate related dangers. How was this unique undersea ‘farming’ idea conceived? After years of listening to scientists most of whom are his colleagues warning of the dangers of coral reef destruction, Nirmal Shah, who is the Chief Executive of the Nature Seychelles, decided to confront the problem. “For years we would be hearing about coral bleaching because that was the big thing in marine science in this region. Scientists came and presented their latest research on re-establishing coral reefs. I got tired of hearing it,” Shah says. “I said okay folks. We know the problems as you people have been researching about it all the time. What are the solutions?” Shah remembers in one of the symposiums organized by the regional scientific body the Western Indian Ocean Marine Science Association (WIOMSA). By advocating for a solution, Shah, who also doubles as president of WIOMSA, had dug himself into a hole of responsibility. He had to take the lead. He sought for both technical and financial support to provide a coral reef restoration solution and give meaning to his colleagues studies and findings. “The interesting thing about coral reefs is that they grow in a desert. Tropical ocean waters are deserts. Coral reefs grow there and create an oasis of life, which benefits everyone,” Shah says. “We started this project three years ago,” Shah says. Frias-Torres explains in detail how the coral gardening which will lead to restoration process works. Initially an entire ecosystem survey was conducted all around Cousin Island to decide the exact locations of the nurseries and the translocation sites too. The other aspect that the survey identified was the type of corals to be nurtured. Frias-Torres acknowledges that high water temperatures and brighter sunlight are the main climate related causes of coral bleaching. The others are human induced such as anchoring, trampling, destructive fishing practices and even pollution. In 1998 the expansive ocean space that is Western Indian Ocean suffered immeasurable damage on its vast coral ecosystems due to El Nino which Frias-Torres explains as a Spanish term meaning “Christ’s child” that was originally used by Ecuadorian and Peruvian fishermen to describe warm ocean currents that led to less fish stocks. “To an island nation like Seychelles the importance of coral reefs cannot be underestimated as coral reefs act as natural barriers which reduces the force of waves and end up protecting beaches, shorelines and coastal communities from erosion, sea-level rise, and destruction of properties,” Frias-Torres says. According to the US National Oceanic and Atmospheric Administration (NOAA) the global benefit accruing from corals stands at $29.5 billion annually. Globally, around 500 million people rely on corals for food, livelihoods and even coastal defense. “Coral reefs are one of the most sensitive ecosystems to climate change and the corals in this region have been quite disturbed,” says Tim McClanahan, a senior conservation zoologist with the Wildlife Conservation Society (WCS) based in Mombasa, Kenya. McClanahan, whose expertise is on coral reef preservation, has been studying western Indian Ocean corals for over a decade and explains how these undersea coral colonies are tied to the all-important human food chain. “If reefs and fisheries were better managed they could contribute more to food security,” McClanahan says. Eight different types of corals species were chiseled from select ‘donor colonies’ within the Seychelles archipelago and used to establish the nurseries. The identification of the donor sites where the coral fragments – referred to as nubbins - were picked are those that had withstood the bleaching. The two Indian Ocean monsoon seasons also played a part in the selection of sites. 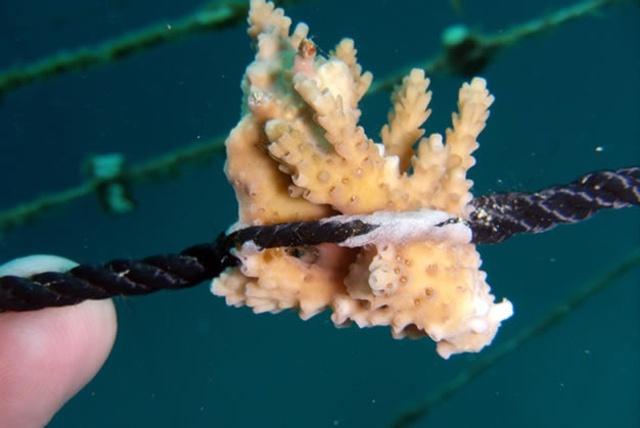 “In the coral reef gardening we have used those from the colonies that survived the El Nino taken from and tie them to nylon ropes of 20 metres each setting up our mobile nurseries. We have two types of nurseries the rope and net nurseries which make up our coral garden,” Reveret says. A total of eight rope nurseries with 40,000 nubbins have been established through the labours of scuba divers and their agility to adapt to ever changing ocean currents. The nurseries are monitored and cleaned everyday with hard brushes to quicken growth rates, of course with a little help from the surgeon fish that eat the algae which stunts coral growth. “As a rule of thumb you don’t use only one species of corals and at the same time you get those nubbins that are resilient. What we are doing is to replicate nature.” Fries-Torres says. Frias-Torres further explains that many branching coral species have evolved to survive and adapt to hurricanes and typhoons and from little broken pieces they can grow new colonies. Shah remembers the challenge he posed to scientists four years ago and smiles cautiously at the strides that has been made so far. Shah explains that the ‘reef rescuing’ project is much more than replicating nature but biased towards solving challenges posed by nature should other disasters occur. “So far the results are encouraging. In the next five years we expect to see the whole ecosystem structures’ taking shape and that is when we will have full answers and directly involve the community owing to the lessons learnt,” Shah says.